Michael, a middle school technology teacher who asked his last name not be disclosed because his school district does not reveal which teachers are allowed to carry guns, has been carrying in his school for three years. He said he had to wrestle with the decision to carry a gun at his school. "It was actually a real, deep emotional time when they asked me," Michael told the Free Beacon. "It took me probably over six months to decide to because it's an intense thing, but the thing that ultimately decided is I want the kids to have a chance and I want to have a chance. If I'm going to throw myself out there anyways, I would like to have something to have a chance to shoot back. Did I ever want to? You know you never want to, but you want to be able to." 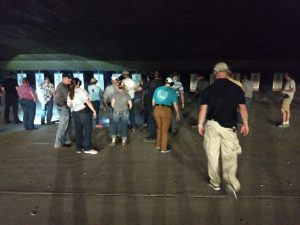 He said he was happy that his district allowed him the opportunity to be armed at school and his connection to the kids he teaches is ultimately what motivates him. "You protect these kids, they become your kids, my kids," he said. "And I want these kids to be safe, have a safe environment and to succeed. And to me this is one more step towards that in this day and age. If something were to ever happen, I want to have that chance to protect my kids." Dawn, an elementary school reading coach who also asked her last name not be disclosed, has been authorized to carry at her school for two years. She's taken similar training in the past but this was her first time through FASTER's course. 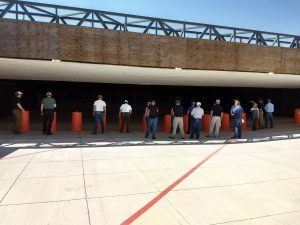 Teachers are generally required to take an advanced active shooter training course each year to meet the requirements insurance companies put in place in order to insure districts with armed teachers. Her motivation to carry at school is more personal. "When my son was in first grade Columbine happened," she told the Free Beacon. "And the school had called me and said he won't take his backpack off. When he got home from school I asked him ‘why wouldn't you take your backpack off?' He said ‘because if the bad guys come into school, I want to be able to jump out the window and run away and run home.' And when [carrying in school] came up, kids need to be able to go to school and learn and not worry about if they're safe. So many of those kids have so much trauma in their own homes that they need a safe place they can come to, and if I can be even a part of that, they're all our babies. We teach them and we have to protect them, and they're all our family." She said she was very confident in the process that teachers who want to carry a gun in school are required to go through in her district. "I mean when it became an opportunity that we could carry, there was a lot of stuff we had to go through to be able to carry," Dawn said. "Not just anybody can carry at school. You have to pass all these background psychological tests, a qualification. So, people need to be informed about how everything really works. It's not just anybody." She said the district keeps strict operational security. 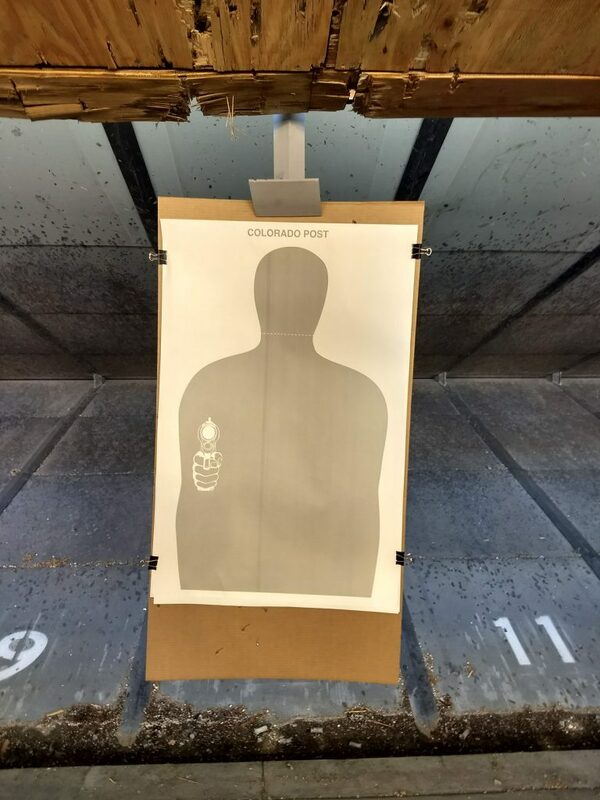 While they post signs informing the public that some teachers are armed, only a handful of people know who is actually armed in order to prevent making them the first targets of a potential attacker. Dawn said she understands why not everybody volunteers to carry a gun in their school and why some feel they wouldn't be able to. "There's a lot of responsibility to that," she said. "I mean, does it make me sick that I would ever have to use that? Yes. Do I carry so I can hurt somebody? No. But those kids are innocent." 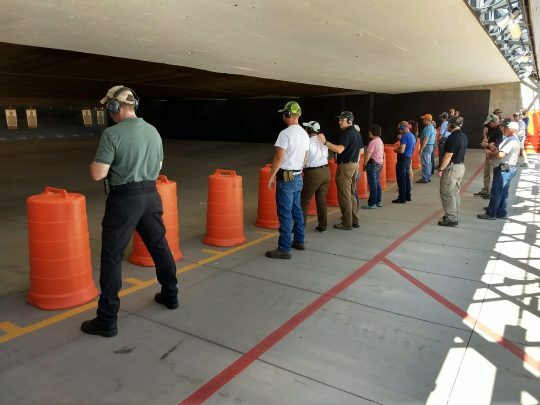 John MacFarlane, a physics and chemistry teacher with 16 years of experience at Academy District 20 in Colorado Springs, has a great deal of experience with firearms and is a NRA-certified firearms instructor. However, his district does not currently allow teachers to carry. He completed June's FASTER Colorado training in hopes it would help him to convince the district to change its mind. "Getting teachers who are highly trained, willing, capable to carry is an ultimate end goal," MacFarlane told the Free Beacon. "I understand the complexity, I understand the hesitancy of school boards to just say we're going to arm teachers because unfortunately a lot of people aren't educated on what that means. They think you're going to hand a box of guns out at a staff meeting and be like alright we're going to train you how to shoot the bad guy. That's the last thing that I want to see. I want to see those of us who are willing, able and highly capable, and have the right mindset for that." He said he was hopeful that he could at least bring the emergency medical training offered as part of FASTER Colorado's course back to his school as a means of potentially saving lives. He said the head of security at his school told him about the medical training their security staff receives and he wondered why teachers aren't given similar training. "I kind of walked away going well wait a second where is our bleeding control, trauma kits in the school, where are our tourniquets?" MacFarlane said. "Has there been a training offered to teachers? We have district security personnel saying how important it is, the use of tourniquets. And it's not a gun, so why aren't those in schools?" He said some want only law enforcement or security to be prepared for a potential school shooting. "At the bare minimum why aren't we trained in the use of tourniquets and packing wounds and using chest seals?" MacFarlane said. "That would be easy to do, and I'm still getting people saying that would disturb a lot of teachers, and I find that just funny. It's a strange attitude of just we'll let other people solve our problems and what we'll do is we'll just hide and give up." It's the same attitude that keeps his district from allowing him and other willing teachers from carrying, MacFarlane said. He faces opposition to the idea from those who believe that teachers should not be armed on school grounds. It's an objection that MacFarlane said doesn't make sense. "I tell people, they say ‘what happens if you get shot,' then I die trying," he said. "I would not be able to live with myself if I couldn't do something. But it's weird for me as a concealed carry permit, I carry everywhere. But when I go into a school, all of a sudden, I can't. My training doesn't change, my mindset, my mental health, nothing changes other than my geographic location. You know I've carried plenty of places where there are hundreds of kids. But we have this mythology of if there's kids around, therefore there can't be guns." Michael, the middle school technology teacher, said he would ask those who don't think he should be allowed to carry in school what they would do if somebody came into their school and started killing students. "What would you do if something like this came along?" he said. "Where do you see yourself in this situation?" MacFarlane said he doesn't believe most people are actually against guns in schools. "Colorado unanimously said we want a police officer in every school who is armed," he said. "We've already decided through voting that that's okay, and then our district said it's okay to have security officers in schools. So, we have guns in schools. What they're saying is we want those people because one they're in a uniform and to quote, ‘highly trained.' Well, if you could tell me what that highly trained is I would be willing to do every single thing that they have done." Dawn, the elementary school reading coach, said critics don't understand that police and emergency medical assistance are very far away from her school and, she believes, teachers and staff will have to deal with any potential attack on their own—something she takes very seriously. "Well a lot of the places, I mean, when somebody comes in—three to five minutes it's over," she said. "Where we live, the cops aren't even going to be there yet. Neither is the ambulance, nobody is. So, would they rather somebody be in there to protect their kids or would they rather have their children die? It's not that it's irresponsible people going out to do what we're doing. There's a reason, there's a compassion. I value life greatly." MacFarlane said he doesn't want to hear more stories about teachers dying while trying to shield their students from an attacker's bullets. "I think a minimum standard of qualification should be necessary, and there should be recalls and there should be more training ongoing if teachers are going to be carrying in the building," he said. "But, unfortunately, the attitude is there's say one hundred teachers in our building, just because 98 of them are terrified of guns, don't like guns, have never seen guns, a lot of decisions are being driven by the fact that those 98% are like that, and I said well what about the rest of us? What about us? "Why do teachers have to die protecting their students? Why can't we live protecting our students?"